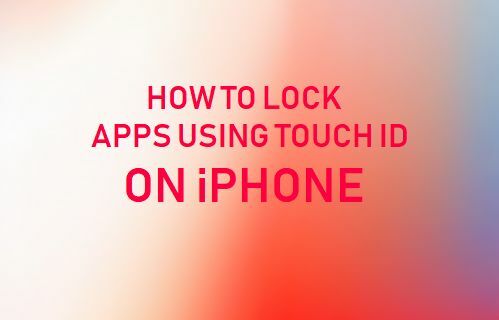 In case you are already using Touch ID to unlock your iPhone, you will be pleased to know that it is also possible to Lock Apps on iPhone Using Touch ID. In order to be able to Lock Apps on iPhone using Touch ID, you need to enable Touch ID for each of the individual Apps that you want to be able unlock and lock using Touch ID. Once Touch ID is enabled for an App, you will be able to Lock and Unlock the App using your fingerprints. As you can imagine, this is much more convenient than setting up a passcode to unlock Apps. Also, you need to be aware that only Apps that provide the option to use Touch ID can be locked using fingerprints on iPhone. For example, popular social media Apps like WhatsApp, Facebook, Twitter and Snapchat do not allow Touch ID, while Apps like Dropbox, Mint, PayPal, Evernote, 1Password and the native Notes App on iPhone can be unlocked and locked using Touch ID. If you are already using finger prints to unlock your iPhone, you can skip this step. If not, you can follow the steps below to Enable Touch ID on your iPhone. Note: If you are setting up Touch ID for the first time, you need to follow the instructions on your screen to first register your fingerprints with Apple. 1. Open Settings on your iPhone and tap on Touch ID & Passcode. 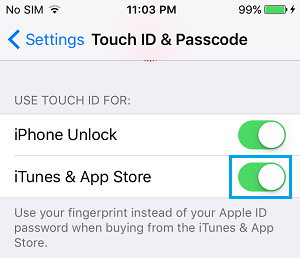 Once you have setup Touch ID on iPhone, you can follow the steps below to enable Touch ID for Apps that you want to Lock and Unlock using your fingerprints on iPhone. 1. Open the App that you want to Lock and Unlock Using Touch ID. In our case, we are using the Dropbox App. 2. Next, tap on the Settings icon located at the top-left corner of your screen (the location may vary for other Apps). 3. 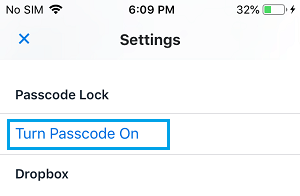 On the App Settings screen, tap on Turn Passcode On option – This may be labelled as Passcode & Touch ID or something similar for other Apps. 4. 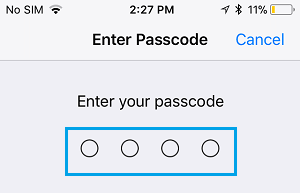 You will be prompted to setup a Four Digit Passcode for Dropbox. 5. 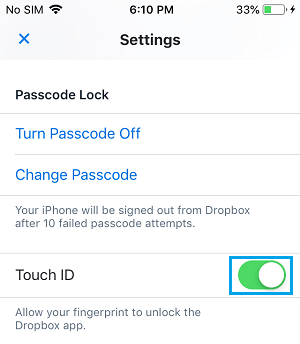 Next, enable Touch ID for Dropbox App by moving the toggle for Touch ID to ON position. Now you will be able to Lock and Unlock this particular App using your fingerprint, instead of using a password to unlock the App. Even if Touch ID is enabled for an App, the App can still display sensitive or private information in the Widget screen on your iPhone. Hence, it is recommended that you disable the widgets for Touch ID Apps in order to prevent the possibility of your private information from appearing in Widgets. 3. On the Add Widgets screen, tap on the Red circle to the left of the App Name and tap Remove to confirm. Repeat the above steps for other Touch ID enabled Apps and tap on Done to save this setting for the Apps.